Last Monday I wrote to Margaret Ritchie inviting her to meet with me to discuss co-operation between our parties in the upcoming British General Election. I proposed that the agenda should include the need to co-operate in specific constituencies to ensure as far as possible that unionism does not increase its share of Westminster seats. Having consulted with our Belfast leadership It was my intention to propose that Sinn Féin would stand aside in South Belfast in return for the SDLP standing aside in Fermanagh South Tyrone. I had included on the letter a telephone contact number where I could be reached. Not having heard anything I wandered down before lunchtime on the Tuesday to her private office to find out what was happening. Her most senior PA told me she was out and when I asked for a telephone number to contact her I was told that she had recently changed her phone and he didn’t have the number. A senior SDLP party MLA who told me he was just a party flunky and didn’t know anything about these matters was there at the time. Eventually a letter of response arrived at my office at the same time as it was given to the BBC. It was a rejection. The fact is that the SDLP approach to this election as to all previous elections has been dictated not by what is good for nationalists or for the peace process, but by their antipathy toward Sinn Féin and what’s in it for them. 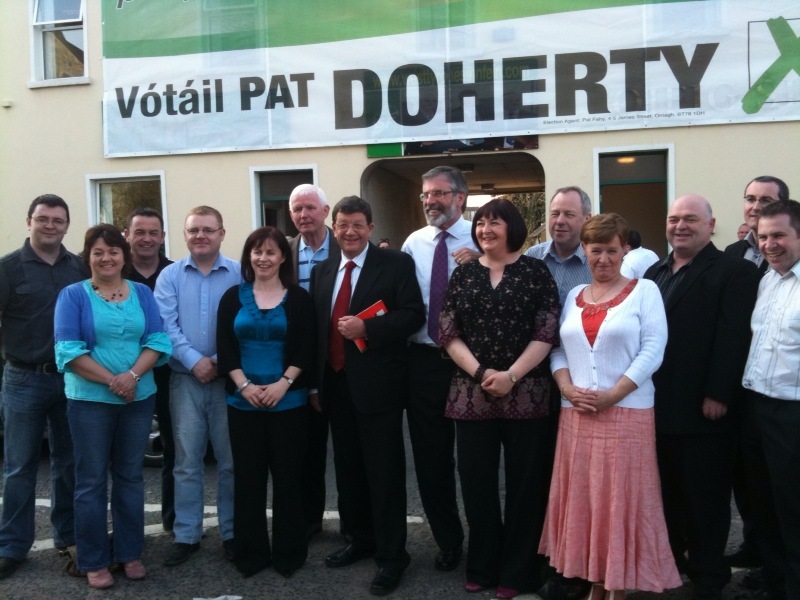 If the Shinners are for it – the SDLP have to be against it. I responded to Margaret Ritchie on the Wednesday. Mar eolas daoibh. Thank you for your letter of 13th April. I was surprised at your rejection of my proposal that we meet to discuss co-operation between our parties in the upcoming election, including the possibility of co-operation in specific constituencies. I note that you did not have the courtesy to meet with me before the release to the media of your response to my letter, particularly considering you were not aware of any specific proposal I might put. Your staff also refused to facilitate a telephone conversation between us when I dropped into your office yesterday in the hope that we could discuss this issue. My intention was to put a firm proposition to you that Sinn Féin would stand aside in South Belfast in return for the SDLP standing aside in Fermanagh South Tyrone. I consider such an approach is in the best interests of both broader nationalism and the wider community. Regrettably, your response to my letter carries the same narrow-minded stamp which has characterized your party’s stance on a range of issues in recent times. It is quite absurd to describe co-operation among nationalist parties as sectarian, unless of course you subscribe to the view that nationalism as a political ideology is sectarian. Perhaps you or your party are again in post-nationalist mode. Nor can any electoral pact between nationalist parties be described in the same terms as the collaboration between the Orange Order, DUP, Ulster Unionists and British Conservative party in an attempt to unseat Michelle Gildernew. Michelle has diligently represented all the people of Fermanagh South Tyrone since she became their MP. She has pursued the same agenda as an MLA and as a Minister in the Executive. She represents, and is a strong advocate of a future based on equality. What the unionist parties have cobbled together represents regressive politics based on a negative agenda. It is about base sectarianism, and the old agenda of division and inequality. Your rejection of the co-operation with Sinn Féin which I propose places your party in exactly in the same camp as those who seek to unseat Michelle Gildernew and return the seat to a unionist and a Tory. There is absolutely no contradiction in Martin McGuiness’ insistence that the Executive Ministers must deliver for the entire community and my proposal that we co-operate. Your claim that Sinn Fein has in some way brought about an under representation of nationalists in government is also absurd. The Justice Minister appointed on Monday last in the Assembly was elected by cross-community support, one of the critical safeguards built into the Good Friday Agreement. I note your party put forward a candidate for this position, and would, presumably, have been quite content to have taken up the post on this basis had he secured the required degree of cross community support. As you know Sinn Fein MLAs voted in favour of your nomination. It was you who failed to win unionist support. And of course your party supported the legislation which established these interim arrangements for appointing the Justice Minister. As far back as May 2006, Mark Durkan told the British House of Commons that he would support such a procedure for the election of a Justice Minister. Your position on the outworking of the RPA is similarly riddled with contradictions. 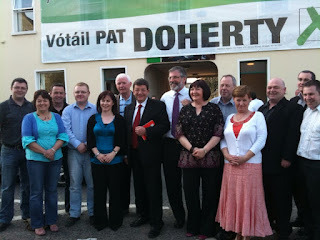 The SDLP advocated a reduction in the number of councils from 26 to 15. Any reduction in the number of councils requires the redrawing of council boundaries. The proposed new boundaries have been defined by the Boundaries Commissioners. The SDLP have been strangely silent until now on the impact of boundary changes. A primary and consistent focus for Sinn Fein in the RPA has been to build the rights and safeguards enshrined in the Good Friday Agreement into new governance arrangements in local government, thus ensuring the interests of all sections of the community are given full consideration in decision making at local government level. And it was Sinn Fein, not the SDLP, who blocked recent proposals by the DUP to gerrymander boundaries in Lisburn, Castlereagh and Belfast. As for abstentionism, it is patently untrue to state that abstentionism works to the disadvantage of people in need. Sinn Fein is a party of active absentionism. We receive a mandate not to sit in the British House of Commons or to take an oath of allegiance to the English Queen. That we actively represent our constituents is an uncontestable fact. You and your party know full well how unimportant SDLP attendance at Westminster is. This is reflected in the attendance record of SDLP which is among the lowest of the 646 MPs. But of course, despite this limited attendance, SDLP MPs found time in recent years to turn up at Westminster to vote for emergency laws which include the continued use of Public Immunity Certificates, 28 day detention without trial, and a continued provision for non-jury trials. You should hardly be surprised therefore that I find your assertion that you ‘feel it important now to be principled and consistent’ as particularly ironic. You have committed to supporting the British Labour party in Westminster, the party currently pursuing a war in Afghanistan which has cost the lives of thousands. There are many differences between our parties. Despite these differences, we have an opportunity and a shared responsibility to work together to ensure the best possible outcome for the entire community from the forthcoming election. It remains my view that we should co-operate towards this objective. The SDLP, in my view, belong to a type of politics in which political elites form and seek to rule over the heads of the people. The arrogance of these political patrons is astonishing. I support Sinn Fein because Sinn Fein want the people to be the political party and be self representing, i.e. Ourselves. We don't need elites in any sector of society. We need equality and community. Take these, so called proffesionals down off their pedestals. They don't belong there. The Sweeper and the Doctor are both citizens, and the Sweeper's son/daughter might make a better doctor than the Doctor's son/daughter and visaversa. Many of these so called proffesionals, including doctors, are completely incompetent weirdos in any case, in my experience. As you quite rightly point out, the SDLP swear allegiance to the english queen. With all the positive qualities that emerge in a war situation from amongst the populace an equal force of negativity is manifest. Therefore, when courage, bravery, daring,ingenuity and other qualities are selflessly displayed, the opposites are also manifest. Cowardice, treachery, betrayal, deviousness. People can also become paralysed by fear and develop behavioural traits that seem completely illogical and unfathomable to those who have held up well. in all the years he has been there showing in any way support for a United Democratic Socialist Republic. It is time for him to go. It may be a nitpicking point but there is no such thing as an English Queen and has not been since the crowns were united by a Scottish King in 1603. There are plenty of people in England who want as little to do with the British state as Irish republicans and nationalists do. I want to do anything and everything I can to help the Irish people achieve the unity which is long overdue, but your frequent conflation of the terms British and English starts to grate after a while. My passport might say that I'm British and that some old lady who lives in the UK's biggest council house is gracious enough to allow me 'her subject' to travel, but in terms of indentity, I am not British, I'm English. Micheal, think you have been at the old "Only Our Rivers Run Free " water again. Our society is being run by elites as most societies are. Unfortunately for us, we are now been run by a very new bunch of elites. New because, these elites were formally so called revolutionaries and socialists, who have recently acquirred a taste for the better and finer things in life. None of these political parties have anything to offer the ordinary people, they are all propelled by self interest, the proof of that was the water charge stitch up, electric hikes and the rate hikes which help pay these politicans their over inflated wages. I know you say many of these other parties are made up essentially from professionals, however, Sinn Fein is also made up from the monied and propertied classes, some of their ministers actually have housing porfolios. If you knock these people i.e. SDLP off there pedestals you might be quite surprised at the people who will very quickly race to replace them. SDLP arrogance, and in particular the arrogance of Margaret Ritchie, will come back to haunt them when they are held responsible for increasing unionist MP numbers going into what looks certain to be a hung parliament. The inreasing meglomania being displayed by Ms Ritchie could cost all nationalists dearly in the end. Hoe the SDLP have the nerve to call themselves a nationalist party is beyond me. If they cost nationalism/republicanism the seat in FST they should hold their heads in shame. However, we cannot distance ourselves from the facts that Westminster still sets many laws that affect me. Specifically abhorrent undemocratic laws such as the Digital Economy Act. If I am to re-elect a party who abstain from Westminster, how would this help me in these cases? I don't care about the sectarianism, I for one am a SNP supporter, and want to see the end of the union. So I find myself aligned with Nationalist over here. Sadly, I find myself less aligned with the SDLP but they maybe the only ones who can represent me in a parliament still setting rules for us. I do agree that it is in the SDLP and Sinn Fein's interests to co-operate by withdrawl of candidates to prevent the wider UK believing Unionism is alive and well, instead of the dying beast it is.